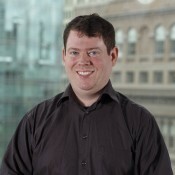 Brian Cusack received both his bachelors (’01) and masters (’03) in Mechanical Engineering from The Cooper Union. While earning his degrees, he worked part-time in the IT department – first as support personnel, and eventually as a small projects developer. After graduation he was hired on full time to write software and support ongoing computer server projects in the IT department. He teaches as an adjunct as often as he can. When he's not at Cooper he's probably building furniture or guitars in his garage in Jersey.